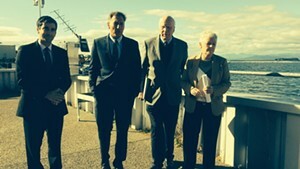 From left, Congressman Peter Welch, U.S. Agriculture Secretary Tom Vilsack and Senator Patrick Leahy at the ECHO Center in Burlington. News about Lake Champlain has been dismal lately, with pervasive blue-green algae blooms popping up in places like St. Albans Bay and Missisquoi Bay. 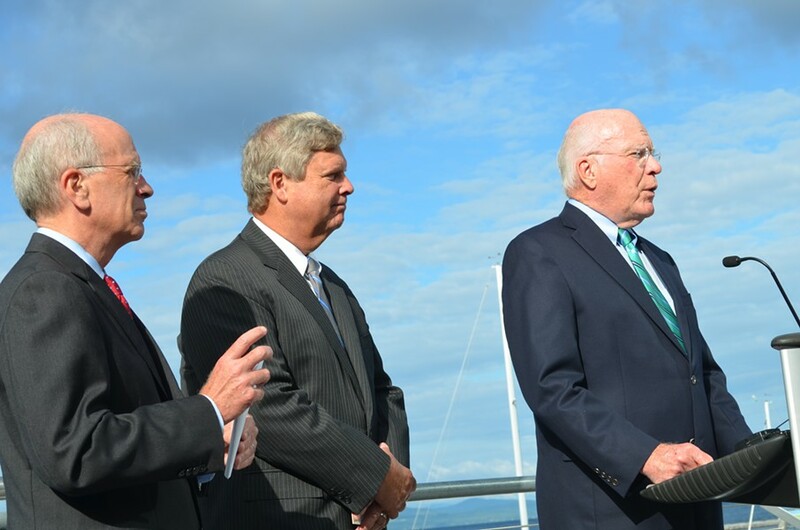 Today, U.S. Secretary of Agriculture Tom Vilsack came to town to announce the arrival of a more welcome form of green — $46 million of federal funding to clean up Lake Champlain. The federal government is doubling its contribution to the effort, according to Vilsack. The U.S. Department of Agriculture (USDA) sent $45 million Vermont’s way over the last decade; now it’s making the same investment over a five-year period. The money will be spent to help farmers create buffers, adopt better tillage techniques and put up fences to prevent livestock from accessing nearby bodies of water, among other conservation efforts. The state is also receiving $1 million immediately help producers plant "crop covers" to stabilize vulnerable soil. Fueling the algae blooms, which can be toxic, is the excessive amount of phosphorous that's finding its way into Lake Champlain. Agriculture accounts for roughly 35 percent of the phosphorous, according to the EPA; stream runoff and development are also major offenders. Vermont recently submitted a new plan for reducing phosphorous to the EPA after a lawsuit from the Conservation Law Foundation proved that the state's previous plan didn't meet federal clean water standards. James Ehlers, executive director of Lake Champlain International, isn't convinced an infusion of cash is going to do the trick. Reached by phone while boating on the lake, Ehlers said, "It's a lot of money, but we’ve already spent a lot of money and the situation has gotten worse." He has been among the clean-water advocates urging the state to rely less on voluntary action and start requiring farms to reduce their phosphorous output. "If we just dump 45 million on farms and don’t hold farms accountable for those practices through enforcement... it's going to be a big waste of money," Ehlers concluded. State officials were more optimistic. “It’s going to amplify our momentum,” said Vermont’s agriculture secretary, Chuck Ross, explaining that the money will help the state implement the plan it proposed to the EPA. In the meantime, Ross and Deb Markowitz, secretary of the agency of natural resources, told reporters after the event they are deploying staff — they haven't determined how many — to Franklin County in an "all-hands-on-deck" attempt to address the expansive blooms there. Vilsack credited Vermont's congressional delegation — in particular Leahy, whom he referred to as a "lion of the Senate" — and state officials for pestering him with requests for assistance. "I received phone calls from both the senator and the congressman, the secretary and the governor," Vilsack said, before teasing Leahy for being liberal with his contact information. Of Shumlin, who is on vacation in Nova Scotia, Vilsack noted, "In fact, I think the senator gave him my cell phone, which I guess I appreciate. Holy cow, the guy calls me every other day."